John Perkins Hinshaw4,6 [John P. Henshaw7,8,9]. Battle at Battle Creek, Tennessee on 21 June 1862. Battle at Battle Creek, Tennessee on 21 July 1862. Battle at Perryville, Kentucky on 08 October 1862. Battle at Stones River, Tennessee on 31 December 1862. Battle at Chickamauga, Georgia on 19 September 1863. Battle at Chickamauga, Georgia on 20 September 1863. Battle on 27 October 1863. Battle at Lookout Mountain, Tennessee on 24 November 1863. Battle at Missionary Ridge, Tennessee on 25 November 1863. Battle at Cassville, Georgia on 15 May 1864. Battle at Cassville, Georgia on 19 May 1864. Battle at Kenesaw Mountain, Georgia on 18 June 1864. Battle at Kenesaw Mountain, Georgia on 19 June 1864. Battle on 05 July 1864. Battle at Georgia on 18 July 1864. Battle at Peach Tree Creek, Georgia on 20 July 1864. Battle at Atlanta, Georgia on 22 July 1864. Battle at Near Atlanta, Georgia on 22 July 1864. Battle at Atlanta, Georgia on 09 August 1864. Battle at Near Atlanta, Georgia on 10 August 1864. Battle at Atlanta, Georgia on 13 August 1864. Battle at Near Atlanta, Georgia on 13 August 1864. Battle at Atlanta, Georgia on 15 August 1864. Battle at Near Atlanta, Georgia on 19 August 1864. Battle at Near Atlanta, Georgia on 20 August 1864. Battle at Jonesboro, Georgia on 01 September 1864. Battle at Atlanta, Georgia on 17 November 1864. Battle at Goldsboro, North Carolina on 01 March 1865. Battle at Averysboro, North Carolina on 16 March 1865. Battle at Bentonville, North Carolina on 19 March 1865. Battle at Goldsboro, North Carolina on 23 March 1865. Battle at Goldsboro, North Carolina on 25 March 1865. I took this time to inform you how I geting along. I am in good health now and hope you are also. I am a little lame and have bin for some time but I am geting beter. I recieved your letter the day before yeasterday but I had the headache So bad that I could not write that day and yesterday. I was on duty so I could not write so I thought while I had time I would write this morning. our regiment is not here now. they have bin gon about one weak. we look for them back to day. they are up the rail road about 40 mils. I went up the other day and the Captain sent me back on the first train after provision and I sent it up to them and I stayed here. There is about 100 of us here now only enough to take care of the camp but we look for the rest home this evening. I hope so for I am lonesome here with such a fiew. we have very hot dry weather down here. crops is poor. the wheat is very poor and the oats hant worth eating. the corn looks good and it need to for the people have nothing to live on. I do not believe there is as mutch corn in all this country as there is in liberty township. we went out yesterday to get some corn and we had to go about 17 mils before we could get two loads. I got a letter from home last week and one from Ellen Rains to and they was all well then. we have regular mail now (but we dont have eny female). we can get your letters in half the time that it did take them to come. I hope adam will have good luck with his colt. I would like to see Clela and I think I will soon for I believe this war is about over. it rather gets me adam to think of miss white being mother but I think the man erned his ten dollars by the hardest and he ought to have it. I think he was a good hand to that what has bin tried so often and not done. I hope you will write. write soon and then you can tell me how the corn looks by that time. I recieved your fine letter last night and it found me in good health. I am Sorrow to hier that you and your family is in sutch poor health but I hope you will all be in good health before this gets their. I got three letters last night. one from you and one from Ellen Bains and one from Miss E. E. L. and they all give satisfaction. I/we left huntsville last friday and came here. we are in camp nier the mouth of battle creek on the Tennesse river. we are on one side of the and the rebles on the other. we can talk to each other. they are throwing up breast work. we can see them very plain. I was guarding the commons yeasterday and last night. last evening I went down to the river bank and one of the rebles came on the other bank and held up a bottle of some thing and invited me to come over and drink with him but I did not feel inclined to go. So I just told him to come over and take breakfast with me but he did not come. They shot three shells at our cannons yeasterday but they done no damage. I dont think there will be eny fighting done here for the river is to wide to shoot across muskets. so they can do nothing but with their artilery and we can shoot cannons just as good as they can. you wanted to no what was the matter of my leg. there was nothing mutch the matter only I strained it one day jumping off the cars but it is well now. I will tell you something about the price of things here. Corn 1.00 per bu. flour 25.00 per barl. bacon $20.00 per hundred. Salt $8.00 per barl. Eggs 30 cts per doz. butter 25 cts pound. I must stop writing now by requesting you to write as soon as you can. I recieved your kind letter today and it found me very well or very neir it. I had the colic last night but I feel allrite this morning. We have plenty to eat now and we live first rate. our regiment was on picket last night and the enimey thout they would try our colum for they come and fired on company (D). about 300 hundred of them. They fired some three or four times apiece at our boys but they did not hurt eny of us. we have very hot and dry weather down here and I cant tell you what things is worth for we cant get out Side of the pickets to buy eny thing. what we cant Steal we do without. we still live close to the rebels. I can See their camp from where I am seting. I dont no when we will have to fight them for we expect it all the time. I am sorrow to hier that they are going to drafting for I am afraid they will make adam and george go. but there is Some boys I would like to see go and they wont go with out drafting. you must excuse my bad writing for I mashed my finger last evening and I wont write mutch this time but I beg you to write soon and maybe I will be in a better condition for writing the next time. You can Direct the same as before. So good bye for this time. I received your letter of the 31st with pleasure. it found me well and harty as I hope this with you and your family. I am at Louisville in stead of Huntsville but we have had a hard time in getting here. we left battle creek on the night of the 27th of August and have bin on the march Ever Sense. The rebels did not get scared and leave but they maid us skedadle one night after they had Shelled us 18 hours killing one man and wounding three more. we had all give up to be taken prisoners but our old Colonel found out that he could get us out and we all left the fort about 11 oclock P M and marched all that night and the next day with out eny thing to eat and then we stopt at the foot of the mountain and cooked some meat and corn and then started up the mountain witch took us one day to cross. on arriving on the side we found general smith there with his Division. then we all moved on towards Murphreis borro leaving the enime behind us as fast as possible and we have bin traveling ever sense but we have got here and I hope we will get a little rest for I am tired of tramping. I expect we will have to go back to Dixie some time but I hope they will let us rest a while first. [the remainder of this letter has not been located and is apparently lost]. I received your letter today. I was glad to hier from you. I am getting along fine now. my health is a little delicate but I am abel to work. I have bin at work in the kitchen for the last week. I dont know how long I get to stay. There is me and another woman working together. I enjoy myself. well she is a good lady and I like to work with her. She is from fayette county ohio. her name is Browning. I think I will stay hier a week or two. I hant going to leave as long as I can stay. I cant get in as a nures for they have as meny nurceses as they want. I may stay in the kitchen a month or so I cant tell. the doctor told me the other day that he would let me no when he wanted me to go to my regiment. I have one sore eye that hurts me ritesmarte but it feels some better today. I think it will be all rite in a fiew days. I would like to come home if I could but there is no chance and I dont say eny thing about it. I would love to see the boys if I could for I think of them evry day. I want you to write to me and let me no if adam has Eagle yet or not. I recieved your letter Friday last and was glad to hier that you was well and I hope this will find you in good health Still. I am still working in the kitchen and I like it very well. I have no woman helping me now but I hope there will be one here in afiew days. I have not bin so well for the last week as I have bin. I have had sutch a pain in my side that I cant sleep mutch in a night. the doctor put four cups on me last night and I feel better this morning. you spoke of moveing in a shanty. well it dose Seem a little odd but I hope it is all for the better. if adam can get to work steady and is abel to do it you may not have to live there long. I hope adam will not have to go in the field but I dont believe they will take him for I dont think he can Stand it and if he is not as well this spring as comon I think he will be exempted from the draft. but if he has to go I supose it cant be helpt so I see no use of greaveing so soon for there is time for that after he is gone. I hope the war will end soon for I dont want to go south eny more for I dont believe I can stand it eny more. I would like to come home and see you after you get moved into your shanty but I see no chance of geting there with out running off and that wont do. well I must close for this time by requesting you to write soon. yes you spoke of sending some of the boys hair. I wish you would do it. He married Charlotte Lee7 [Charlottie Lee9,15, Charlotta Lee2, Lottie Lee16], Apr 7 18707, Cass County, Missouri7. Charlotte, daughter of David P. Lee & Sarah Haughey13,17,18,19,20, was born May - 184813,17,18,19,20 [about 18473], Ohio13,17,18,19,20. Lee, David P., age 63, born in Ohio; farmer; $5000 real estate; $1700 personal property. Lee, Mary, age 57, born in Illinois; keeping house. Lee, James H., age 38, born in Ohio; house carpenter. Lee, Wilson S., age 30, born in Ohio; farmer. Lee, David P., age 13, born in Illinois. Hinshaw, John, age 27, born in Ohio; farmer; $150 personal property. Hinshaw, Charlotta, age 22, born in Ohio; keeping house. Hinshaw, Molly, age 1, born in Illinois. Hinshaw, John P., age 37, born in Ohio; farmer. Hinshaw, Charlet, wife, age 33, born in Ohio; housekeeping. Hinshaw, Alverta, daughter, age 11, born in Illinois; parents born in Ohio. Hinshaw, George A., son, age 9, born in Missouri; parents born in Ohio. Hinshaw, James P., son, age 6, born in Missouri; parents born in Ohio. Hinshaw, Joseph N., son, age 4, born in Missouri; parents born in Ohio. Hinshaw, Charlotte, head-of-household, age 52, born May 1848 in Ohio; father born in Ohio; mother born in Virginia; widow; 6 children, 3 living; occupation: dress maker; owned home (free). Henshaw, Charlotte, head-of-household, age 61, born in Ohio; father born in Ohio; mother born in West Virginia; widow; 6 children, 3 living; occupation: sewing, dry goods store; owned home (free). Hinshaw, Charlotte L., head-of-household, age 71, born in Ohio; father born in Ohio; mother born in "South Virginia"; widow; owned home (free); occupation: none. 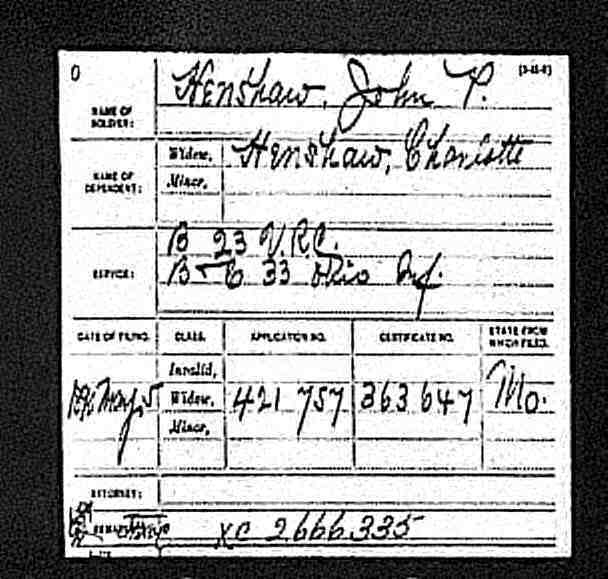 Hinshaw, Charlotte, head-of-household, age 81, born in Ohio; father born in Ohio; mother born in Virginia; widow; owned home ($2000 value); no radio in home; occupation: none. Funeral services for Mrs. Charlotte Hinshaw were held this afternoon at 2 o'clock at the Hays Service Rooms, conducted by the Rev. J. Winston Pearce of the First Baptist church. Miss LaNeta Wirth, accompanied by Miss Emily LeMoine, sang two selections, "In the Garden" and "Asleep in the Arms of Jesus". Pall-bearers were Carl Wirth, Elza Hinshaw, William Owings, Ben Lawless, George Hinshaw, Preston Bullock. Interment was at the Deepwood cemetery. Arrangements were in charge of the Hays Funeral Service. 1870 census, Dayton P.O., Cold Water Township, Cass County, Missouri; page 537B, line #3, dwelling #58, family #63. 1880 census, Washington Township, Vernon County, Missouri; roll T9-0739, ED 215, page 492B, line #32, dwelling #16, family #16. Contribution from Gaylord Carlyle Hinshaw. Obituary of Joe Hinshaw, the "Joplin News Herald", Thursday, Dec 11 1947.
Letters dated 1871-1882 from John P. & Lottie Hinshaw. 1870 census, Dayton P.O., Cold Water Township, Cass County, Missouri; page 537A, line #38, dwelling #58, family #62. 1900 census, 3rd Ward, Nevada, Center Township, Vernon County, Missouri; roll T623-906, ED 121, page 19B, line #75, dwelling #388, family #399. 1920 census, 3rd Ward, Nevada, Vernon County, Missouri; roll T625-965, ED 163, page 2A, line #20, dwelling #32, family #34. 1930 census, 3rd Ward, Nevada, Center Township, Vernon County, Missouri; roll T626-1250, ED 10, page 8A, line #17, dwelling #187, family #220. 1910 census, 3rd Ward, Nevada, Center Township, Vernon County, Missouri; roll T624-827, ED 141, page 7A, line #21, dwelling #150, family #151.